This weekend I was fortunate enough to have my friend Leslie Jacobe, Publicity Coordinator for Wheel of Fortune and also Events Coordinator for Leslie Jacobe Events, join me as a guest reviewer for In the Mix. 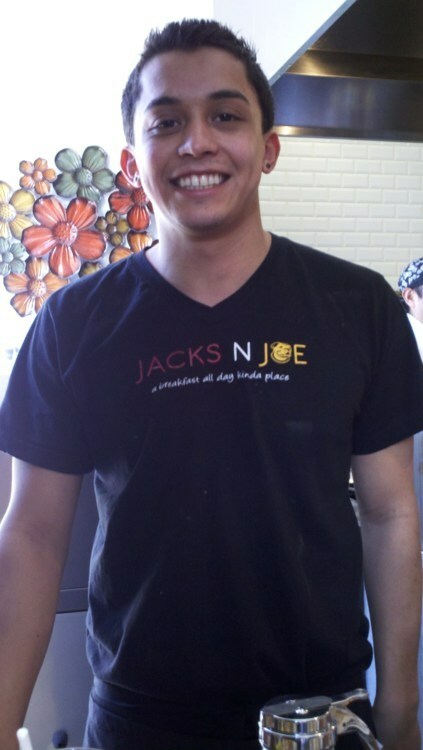 As Leslie is a resident of Downtown Los Angeles, and a USC alumn, at her recommendation we visited USC hot-spot Jacks n Joe on South Figueroa St and West Adams Blvd in Los Angeles, CA. As this restaurant was also recommended to me by a former intern (a current student at USC) I had pretty high expectations when pulling into the parking lot. Typically when my expectations are this high, I’m usually disappointed; in this case however – I was blown away with the first bite! 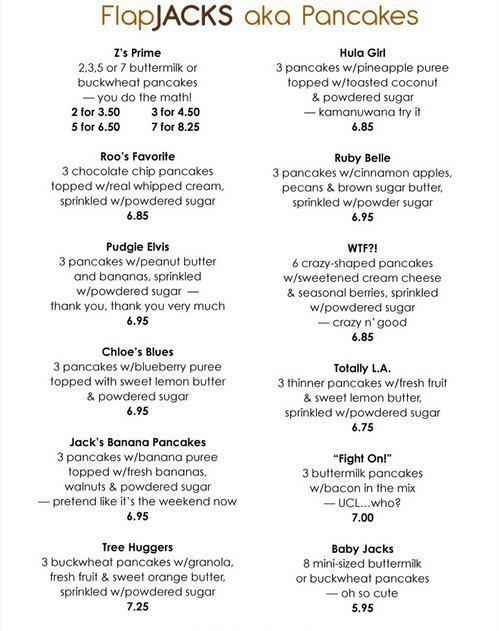 So with my blog, as you know by now, I typically post a photo I take of the menu; however, because Jacks n Joe’s pancake options are so intricate, I wanted to do the menu justice, and display how awesome these choices are by posting the menu directly from their website. Leslie jumped right in and ordered the Jack’s Banana Pancakes with no walnuts, and while I was eyeing the Hula Girl, I ordered the Pudgie Elvis. For a little added trivia, Sonny informed us that the Pudgie Elvis is actually named after the owners’ bulldog you see in the logo. Guess the dog ate too many pancakes! Now, if I haven’t already mentioned this: I love peanut butter. I love peanut butter probably as much as I love pancakes. And the fact that I’ve never combined the two is unheard of, I know. But from the smell alone, I knew this breakfast was going to be one for the charts. Well, the quality of the Pudgie Elvis soared off the charts. I’ve never had a pancake breakfast like this before. See, it’s actually somewhat easy to mess up a pancake-option like this, mainly with the peanut butter. You can easily pack on too much peanut butter, melt it too much, or not enough. 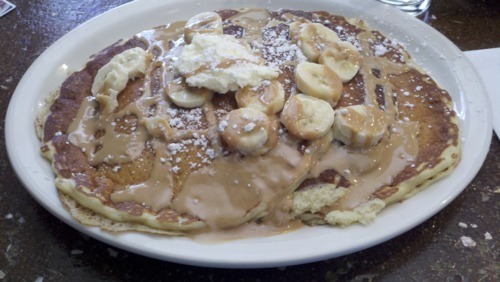 Re-looking at this delicious drizzle of peanut butter over powdered sugar, fresh bananas, and fluffy pancakes, the Pudgie Elvis automatically receives 5 stars – er, stacks, as Leslie’s husband suggested. 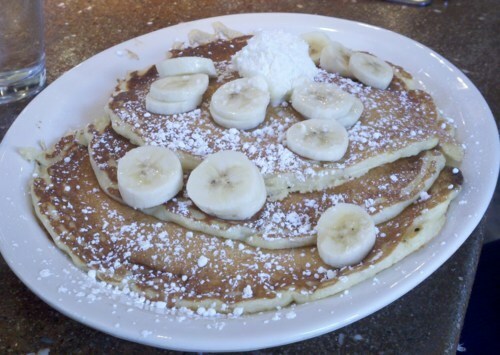 This dish was the perfect combination of peanut butter, powdered sugar, and banana. Somehow among all these luxurious ingredients, the pancakes were not a drop greasy, and can I tell you a secret? For the first time in my entire life I ate pancakes without putting on a hint of syrup. 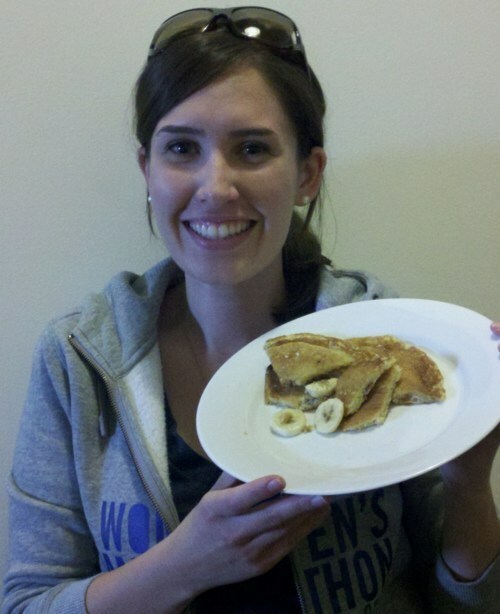 Leslie’s Jack’s Banana Pancakes (minus the walnuts) tasted just as amazing as they looked. “Wow, the texture is perfect, and not heavy at all.” In fact, by the end of the meal, Leslie’s reaction was “I can’t believe I ate half of these without syrup – and the syrup is really good!” Well Leslie, it all goes back to Ma’amCakes’ motto that a truly delicious pancake doesn’t need syrup. Hey, Leslie: I’d like to buy a vowel please, so I can give this restaurant an A+! Thank you so much Leslie, for being a part of Saturday Brunch with Ma’amCakes!